The Church first opened for Sunday Mass on 5th November 1905. The Original site was a blacksmith’s forge in Hollydale Road. The blacksmith lived in the adjoining house, which for the first few years was the presbytery. This house was demolished when the church was extended in 1973. Miss Frances Ellis paid for the site and the building of the church. She spent over 14 million pounds in today’s money building churches in London, all of them more or less identical and nicknamed “Ellis Boxes”. At the time St Thomas the Apostle cost £3000. The first parish priest was Fr. Peter Ryan and the Solemn Opening of the church by Bishop Peter Amigo took place on Friday 10th November, when he gave an address followed by Benediction. The parishioners were very poor, so collections were low. At one point Fr. Ryan had to ask the Bishop for £30 to pay the local trades people. Fr. Ryan was followed by Fr. George Leidig, who was the parish priest throughout the First World War. Although he had been born in Deptford, he had a German surname, and this caused him problems during the war, when people in the local shops refused to serve him. Parishioners helped him out by providing meals, which he at times gave to beggars who arrived at the door. He organised a men’s and boys club to keep hold of boys leaving school and going to work and appealed for funds in the Tablet for what he called “the poorest mission in South London”. When the Bishop visited in 1919 he found lodgers living the presbytery to help with expenses. During Fr. Leidig’s time the presbytery was moved to its present site at 81 Evelina Road. Fr. Leidig was found dead in the presbytery on All Souls Day 1921, after failing to arrive for the early Mass. The next priest, Fr. Cornelius O’Donoghue managed to improve the financial situation by having seat rents and was able to build a new church hall costing £200. During his time in the parish the Stations of the Cross were erected in 1927 at a cost of £170. The only information available is that they were carved by a German man and his son in a room over Burns & Oates shop, in Victoria Street. Fr. Donal O’Brien came to the parish in 1934 and arranged for the rebuilding of the presbytery, as the original house did not even have a bathroom. It was finished in 1937 at a cost of £1900. On 30th September 1940 a bomb fell on the other side of Evelina Road and the new presbytery was badly damaged while the church lost all its windows. For a time Masses were held in a room above the bar in the public house in Kitto Road. The church was eventually repaired and could be used again, but the presbytery was uninhabitable for the rest of the war with a debt of £1338 still on it. The priest was only able to move back in September 1945, and lived in a house in Drakefell Road until then. Fr. Hugh Lagan took over the parish in 1958 and set about raising money to build a larger church to accommodate the parishioners. The size of the original church meant that there were six Sunday Masses to get everyone in. On Good Fridays the service was relayed to the hall and crowds of people had to stand in the street who could not get in at all. Fr. Lagan would have liked to completely rebuild but could not get planning permission because of problems over a possible ring road, and was only allowed to put an extension on the original building. During the building work, 1973-1974 Sunday Masses were in St Thomas the Apostle and weekday Masses were in the presbytery. Fr. Lagan retired in 1982 having spent his whole time as a parish priest in Nunhead. Fr. Anthony Cridland followed Fr. Lagan and during his time changes brought about by the Vatican Council 1962-1965 came into full effect. Activities with local churches were encouraged. In 1989 the church was finally consecrated by Archbishop Michael Bowen and relics of St. Thomas the Apostle and St. Philip Howard were placed in the altar. In 1996 the parish was put in the care of the Sacred Hearts Fathers. The Parish priests from 1996 to 2010 were Fr. Padrig, Fr. Brian, Fr. Pat, Fr. Eddie and Fr. Fegual. In 2010 it was announced with much regret that the due to the numbers declining in priests in the Sacred Heart Community that they had to leave the community of St. Thomas. In May 2010 the parish was put in the care of the Missionaries of St. Paul (MSP). Apostle. He was ready to die with Jesus when Christ went to Jerusalem, but is best remembered for doubting the Resurrection until allowed to touch Christ’s wounds. Preached in Parthia, Persia and India, though he was so reluctant to start the mission that he had to be taken into slavery by a merchant headed that way. He eventually gave in to God’s will, was freed, and planted the new Church over a wide area. He formed many parishes and built many churches along the way. His symbol is the builder’s square, from an ancient story that built a palace for King Guduphara in India. Memorial: 3 July; celebration of the transference of his body to Edessa in Mesopotamia. “Thomas, one of the twelve, called the Twin, was not with them when Jesus came.” He was the only disciple absent; on his return he heard what had happened but refused to believe it. The Lord came a second time; he offered his side for the disbelieving disciple to touch, held out his hands, and showing the scars of his wounds, healed the wound of disbelief. Dearly beloved, what do you see in these events? Do you really believe that it was by chance that this chosen disciple was absent, then came and heard, heard and doubted, doubted and touched, touched and believed? It was not by chance but in God’s providence. In a marvelous way God’s mercy arranged that the disbelieving disciple, in touching the wounds of his master’s body, should heal our wounds of disbelief. 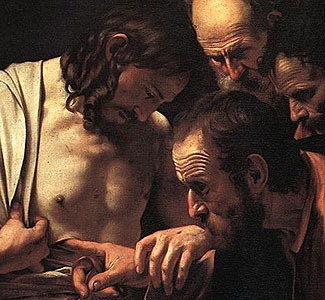 The disbelief of Thomas has done more for our faith than the faith of the other disciples. As he touches Christ and is won over to belief, every doubt is cast aside and our faith is strengthened. So the disciple who doubted, then felt Christ’s wounds, becomes a witness to the reality of the resurrection. Touching Christ, he cried out: “‘My Lord and my God.’ Jesus said to him: ‘Because you have seen me, Thomas, you have believed. '” Paul said: “Faith is the guarantee of things hoped for, the evidence of things unseen.” It is clear, then, that faith is the proof of what cannot be seen. What is seen gives knowledge, not faith. When Thomas saw and touched, why was he told: “You have believed because you have seen me?” Because what he saw and what he believed were different things. God cannot be seen by mortal man. Thomas saw a human being, whom he acknowledged to be God, and said: “My Lord and my God.” Seeing, he believed; looking at one who was true man, he cried out that this was God, the God he could not see. Nunhead Cemetery is perhaps the least known but most attractive as well as being the second largest of London’s Victorian cemeteries. This pleasant 52-acre cemetery is a tranquil wilderness. Its formal avenue of towering limes and the Gothic gloom of original Victorian planting give way to paths which recall country lanes of a bygone era. An Anglican chapel overlooks a large woodland area. Ash and sycamore conceal headstones, angels and impressive gothic tombs. Four hundred interesting personalities were laid to rest at Nunhead between 1840 and 1998. The first entry was Charles Abbott, a 101-year-old Ipswich grocer and Charterhouse brother and the last, a volunteer soldier who became a Canon of Lahore Cathedral. There’s a Scotsman who became an African explorer, another who fought in the American Civil War, an Irish freethinker, a French Huguenot Marquis, an inventive admiral, and a dashing cavalryman who rode in the Charge of the Light Brigade and lived to tell the tale. Also buried at Nunhead are heroes who fought at the battles of Trafalgar and Waterloo, and a gallant airman who lost his life chasing an enemy Zepplin across London’s skies. Among the many remarkable women buried at Nunhead, there is an actress, two novelists, a poet, the leader of a religious sect, and others whose only claim to fame is that they lived on this Earth for one hundred years or more. One of the most intriguing memorials in South London’s Nunhead Cemetery is the obelisk dedicated to five 18th century political reformers who put the cause of political justice before their own lives and became known as the ‘Scottish Martyrs’.